All You Can Ever Know or need to know is highly recommended by Little Fires Everywhere’s Celeste Ng. Thrilled that my ARC (Advanced Readers Copy) was Nicole Chung’s first inscription of this interesting novel, a journey of identity. 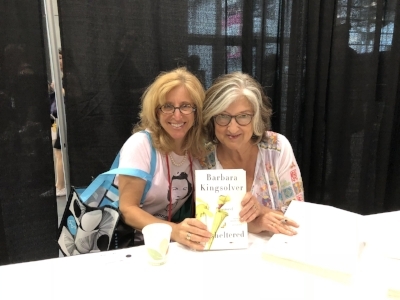 Barbara Kingsolver wears Naturalizers. This fact, discovered in a brief conversation with Kingsolver, an American literary treasure, solidified absolutely that my world is now complete. Can wait to dive into Unsheltered published by Faber & Faber. Drunks by Christopher M. Finan, is an historical examination of alcoholism and recovery in our country Addiction is a treatable mental illness, a fact finally here and accepted. Fiction and non-fiction books devoted to this acknowledgement continues to grow. Published by Penguin. 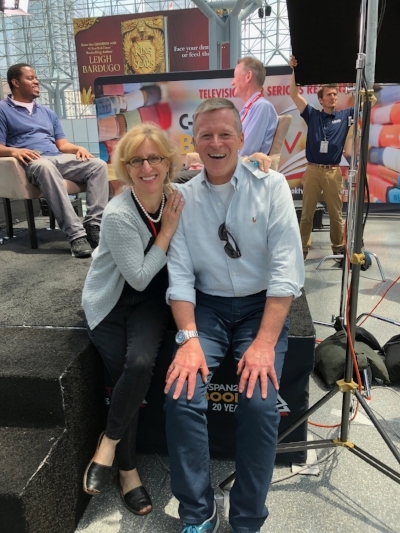 "Every weekend, for the last 20 years, C-SPAN2 has featured Book-TV--48 hours of author interviews, readings, panels and book fairs." If this quote sounds familiar, then you'll understand my every-Saturday devotion to Book-TV biblio-journalism and why I froze up like a fangirl when I met Peter Slen. Proudly will enjoy a cuppa with my Book-TV mug for the next twenty. Forecast themes: Activism. Korea (See A). Themed cooking-travel. "Girl" titles finally on the wane. Mostly. Thank god. H.R.H. royalty is still hot. Curtsey to BBC Masterpiece Victoria, The Crown and the wedding. And Corgis. I missed Ransom Riggs. Feeling peculiar and hollow. Just discussed Barry Joseph's Seltzertopia yesterday. Nu? Wishing Berhman House had the ARC available. However, my Jacksonville. Florida audience was bubbling for more about Barry's upcoming title. Yes, that's Dr. Ruth Westheimer holding Barry Joesph's Seltzertopia and he with her graphic novel, Roller Coaster Grandma. Kingsolver. See literary Queen B. Lines oh-so long and sinewyly silly for individual pub house author signings: there must be a better way. Massage therapists. Obvious necessity for BEA 2019. Glad the survey asked! 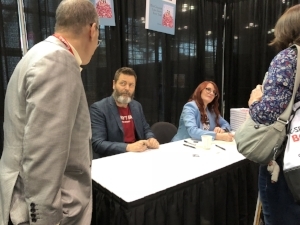 Nick Offerman was solicited by pub house rep, proposing woodworking show host deal. NO’s courteous declined leads one to believe that this idea is already on Dutton’s drafting table. Oblivious I was the the 10.6 miles walked within the Javitz Center in one day. Puffin + Penguin + Pantone = partnership with incredible potential, that, alas, needs way better press. Phaidon needs no presslift as its beautiful books trigger biblioswoontopia. Quote books. Everywhere. See Phaidon. Roz Chast. Neurotically adorable. As only a neurotic would know. Selznick, Brian celebrates Harry Potter's 20th. Yes, 20 wizarding years and still, no one has gotten hint: Hermoine's time-turner necklace pour moi. Titles found, worthy of Chapter Endnotes Readers' time. From authors who are living. Robustly aerobic. See, I’m open. Useful. Only so many book bags can one book lover employ. And then it becomes hoarding. Visqueen. The consistency of my brain because of the bibiloverload. Wishing it would rain for a month so I could sit inside and read. X. My phone fell on the floor during a commonly-experienced event: a freenzy over free fill-in-the-blank-biblio tchochkes. Some lovely soul spotted it and returned it to me within the world's longest 10 seconds. Yoku means bathing. Shinrin Yoku is a Japanese term for forest therapy, like feng shui for the outdoors, or, the maternal wisdom, "Go outside and play." Either way, Yoshifumi Miyazaki's, Shinrin Yoku The Japanese Art of Forest Bathing is a beautiful book about about the therapeutic wonders of Mother Nature. Try it. You'll like. it. Zero reason to complain. The crowds were full of kind, nice people. The lines, full of same. Panel discussions, interesting. 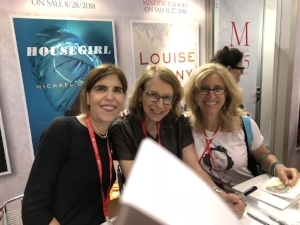 Authors, gracious. A zen community, all lovers of the written word. 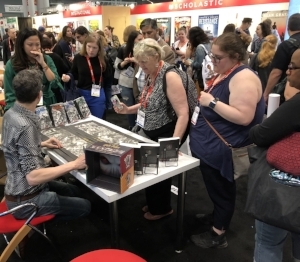 This almost Ashrei or OULIPO-esque post gratefully acknowledges that Jan and Mike Molyneaux and Desiree Bailey of Jacksonville, Florida's San Marco Books and More are to be credited, thanked or blamed for unleashing my inner Laocoon behavior at Black-Friday-fueled-biblio furvor at BEA in NYC. From wherever your perch where you read this epistle, please support your local bookstore. I'll be discussing BEA on National Public Radio on Tuesday. Tune in to NPR's WJCT 89.9 FM First Coast Connect Book Club, 9:30 am EST. Or download the app.